Keep your belts and ties conveniently stored on this easy to reach hanger. The hanger provides visibility and accessibility without taking up a lot of space in your wardrobe. 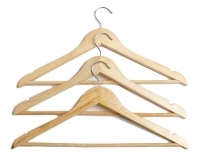 Our black wooden hangers preserve and protect your clothing while helping to keep your wardrobe neatly organised. Made from solid wood with a black finish and swivel chrome hook. Our clear boot boxes keep your boots visible while they're being protected and your wardrobe organised. The simplicity of the design allows you to stack the boxes for storage efficiency, yet access your boots with ease. Canvas cover to fit our Eurowire freestanding wardrobe. 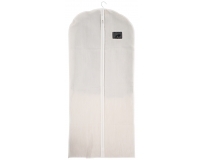 Easy zip access cover adds extra protection against dust and sun light. 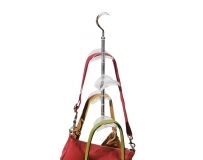 Make the most of your wardrobe space with these chrome skirt/pant hangers. They allow you to hang multiple items on the one hanger. The black rubber ends on clips protect your clothing and are non slip. Hang tight clip secure hangers to the clothesline which you pop your own coathangers through. This prevents clothes from falling off the line or bunching. Pack includes 20 washing line clips. These fashionable copper hangers feature a bar for holding garments and have an indent for holding straps in place. This slim hangers save space in the wardrobe. Our Satin Coat Hanger features thick padding that covers the entire hanger, perfect for looking after garments while stored in your wardrobe. A great gift for all females! Make the most of your wardrobe space with these chrome skirt/pant hangers. They can be hooked together or used separately. The black rubber ends on clips protect your clothing and are non slip. These black coat hangers feature steel hanging hooks. The black frames offer padded areas to protect your clothes. These are ideal for hanging jackets or sports apparel. Hang tight clip secure hangers to the clothesline Prevents clothes from falling off the line or bunching. Pack includes 5 coathanges and 5 washing line clips. 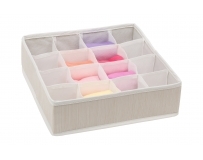 These handy polypropylene drawer dividers can be snapped together to form individual compartments for organising your drawers. They are also able to be trimmed to fit smaller draws or additional pieces can be added for larger drawers. Made up of four rows that can be clicked together. They are also able to be trimmed to fit smaller draws or additional pieces can be added for larger drawers. Made up of 8 rows which can be clipped together to fit drawers. Additional pieces can be added. A simple and effective freestanding storage solution for bedrooms, hallways, studies or even the garage. The smooth-gliding wheels provide easy and convenient mobility. 2 adjustable shelves; 1 acting on the top. This garment rack feature's a double rod for extra hanging capacity as well as being adjustable in height. 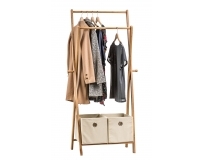 Instantly add hanging space for seasonal clothes, laundry, or for your guests' clothes with our Garment Rack. 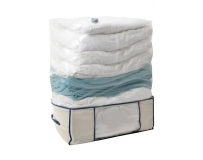 It is adjustable in height (126-169cm) and width (93-145cm) to accommodate almost any length of garment and virtually any space. It features smooth-gliding wheels for convenient mobility. Instantly add hanging space for seasonal clothes, laundry, or for your guests' clothes with our chrome finish garment rack. 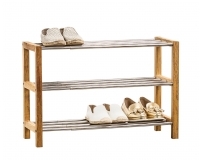 This rack expands both in width and height to fit any space.